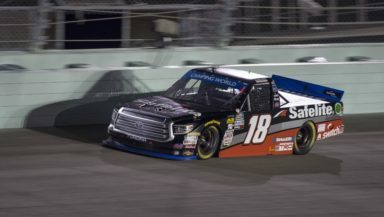 The NASCAR Camping World Truck wrapped up another exciting season of thrilling finishes and fresh faces in victory lane, as well as familiar faces who had a career high season. If this continues next year, 2019 will just be as exciting as 2018. Here are four takeaways from the Homestead race from this past weekend. 1. Harrison Burton Full Time In 2019 – About a week ago, it was announced that Kyle Busch Motorsports signed Harrison Burton full time for next season driving the No. 18 KBM Safelite Tundra formerly driven by Noah Gragson who is moving on. Burton will have big shoes to fill when he takes over after running a partial season this year. 2. Jesse Little Shines With Top Ten – While running a limited schedule due to funding this year, Little made the most of it after completing just nine races. Homestead was his first race since Fort Worth, a couple of weeks ago. He started ninth and finished ninth. Little also finished ninth and seventh in both stages, respectively. Not a bad night for a team who I believe can compete for wins when the funding is right. Little ended the 2018 season with nine starts, six top 10s and a best finish of sixth at Iowa. 3. Johnny Sauter and Brett Moffitt End The Season With Most Wins – It was the best of both seasons for Sauter and Moffitt who had the most wins this season. Sauter and Moffitt both had six victories. The only other winners this season were Kyle Busch, John Hunter Nemechek, Noah Gragson, Justin Haley, Ben Rhodes, Chase Briscoe, Grant Enfinger, and Timothy Peters. In the end, the cream rose to the top with Moffitt winning and collecting his first championship. 4. Sheldon Creed Shines With Top Five – The 2018 season ended on a high note for the 2018 ARCA Champion Sheldon Creed, who is running full time in 2019 for GMS Racing. Creed finished the race in fifth and placed 10th and ninth in both stages. It the best finish for Creed this season after just making five starts.